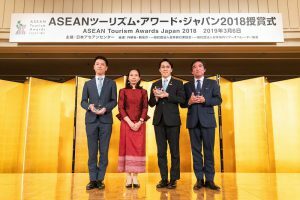 The ASEAN-Japan Centre held the awarding ceremony of ASEAN Tourism Awards Japan 2018. 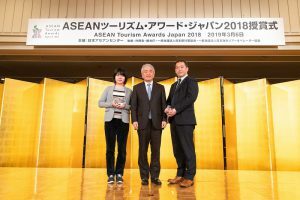 The ASEAN Tourism Awards Japan was held for the first time. 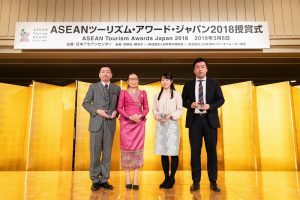 Awards were given to 11 excellent tour products to ASEAN destinations in 6 categories. 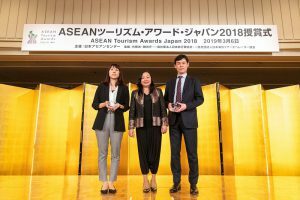 There were also commendation of influencers to 1 group and 3 individuals who contributed to the promotion of ASEAN tourism. 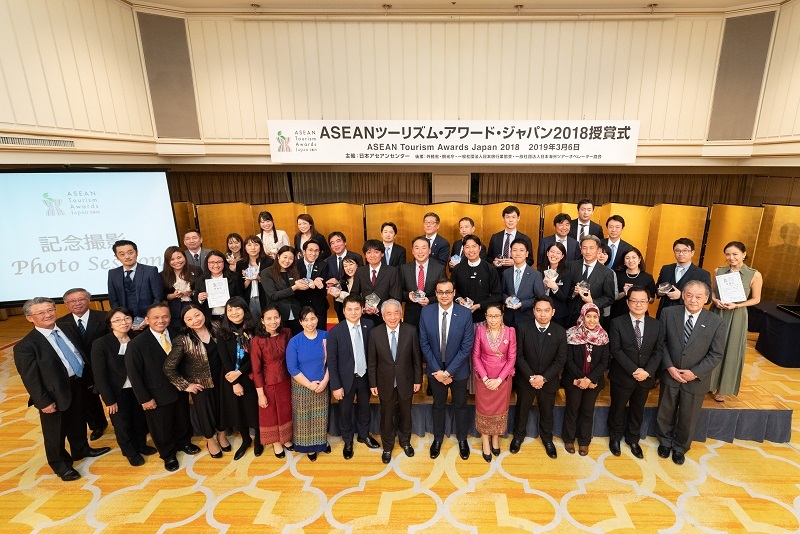 The ceremony was attended by not only the awardees from travel agents, land operators, and airlines, but also by representatives of the governments and other associations of the ASEAN Member States and Japan, including Mr. Jun Takashina, Vice Commissioner, Japan Tourism Agency. *English tour names were translated by ASEAN-Japan Centre and are for reference only. 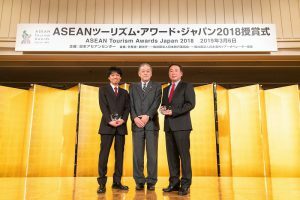 <Reason> Timely product to meet the launch of the direct flight of Royal Brunei Airlines, inviting Japanese tourists to visit undiscovered destination, Brunei. 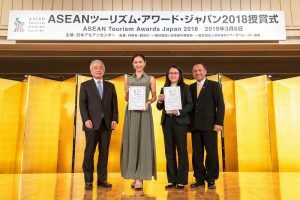 The product includes stay at the gorgeous Empire Hotel which is one of the Brunei tourism highlights, visits to downtown and oil field as well as a river trip to Mangrove forest, and ideally offers both city and nature attractions. It is also remarkable that the number of customers greatly exceeded the initial target number. <Reason>Customers will travel on the first class flight and stay four consecutive nights at super deluxe Siam Kempinski Hotel. In spite of high tour price of JPY600,000, it had more than 80 customers. 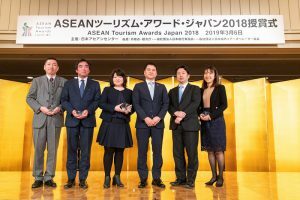 Additionally, the tour received high evaluation from participants, as satisfactory rate was 95% , proving that arrangements to accommodate personal needs of customers worked successfully. <Reason>Participants of the tour will experience training in English on how to be a cabin crew at a facility of Malaysia Airlines which is actually used by the airline’s cabin crews. 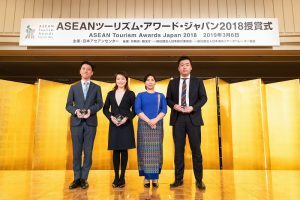 The unique experience will be encouraging and eye-opener for participating youths who have interest to work in an airline and hospitality industry in the future. 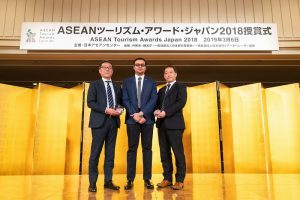 Its contribution to the travel industry is also significant as it provides youths to realize how to fulfill their dream to work in the industry in a different cultural environment. <Reason> This study tour brings participants not only to Manila but also to other localities in the Philippines to see workplaces of women entrepreneurs as well as social business/fair trade companies. Such experience will provide a unique opportunity for participants to experience various social issues which they are unable to learn from books. It is interesting to see how the participants will reflect their memorable experience in their future lives. <Reason> The birdwatching tour to Negros Island with an expert. Tour information includes a list of birds on the island which should be very enticing for birdwatchers. The way how they carefully designed the program for the niche market was highly evaluated by the juries. 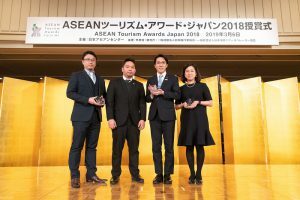 <Reason> The juries evaluated the product as a new approach compared to existing tours to Borneo which are more or less standardized. Participants will visit Bilit, a less known destination for Japanese, and fully enjoy seeing wild life by joining this high quality tour. <Reason> The tour pamphlet impressively introduces seven resorts in Vietnam, both already familiar destinations and some new ones. Consumers can enjoy selecting their destination by comparing different resorts in Vietnam. <Reason> The tour program provides relaxed itinerary using direct flights and yet features highlights of Cambodia tourism in six days. 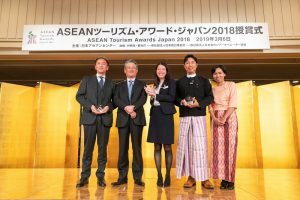 The tour had more than 2,000 participants since February 2018, whose program reflected needs of customers such as three days in Siem Reap to see Angkor Wat ruins and all meals included. <Reason> The itinerary covers Vientiane, Luang Prapang and Pakse in seven days. By maximally using domestic flights, participants are able to travel with less stress. It also includes various experience-based programs to make the tour more memorable one for participants. <Reason> A tour with so many elements for customers to experience various attractions of Myanmar. In addition to visits to famous tourist places, it provides interesting experience for participants such as chartered train ride with minority tribes, exchange program with elementary school students. The program rightly reflects its name “super spectacles” and the juries saw the enthusiasm of the product developer in the program. <Reason> This product is a tie-up with a TV program, and successfully made program viewers to join the tour and become familiar with Myanmar. 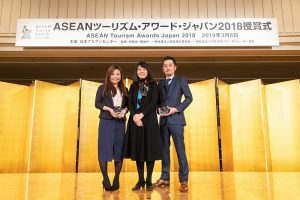 The juries highly evaluated that by using the new method to recruit customers though the TV program, the company developed and reached a new segment group, female travelers in 40s or above.